Model and skin chef May Lindstrom wants you to feel good in your own skin. Her wildly successful artisan line, May Lindstrom Skin, is a well-edited (just four products for now) collection built on the spa ideals of nurture and restoration. May Lindstrom Skin isn’t about washing and going; it’s about taking the time to truly experience the beauty of caring for yourself, one step at a time. May embodies this mindset in everything she does. I’m thrilled to bring to you today part one in May’s natural beauty buff routine. 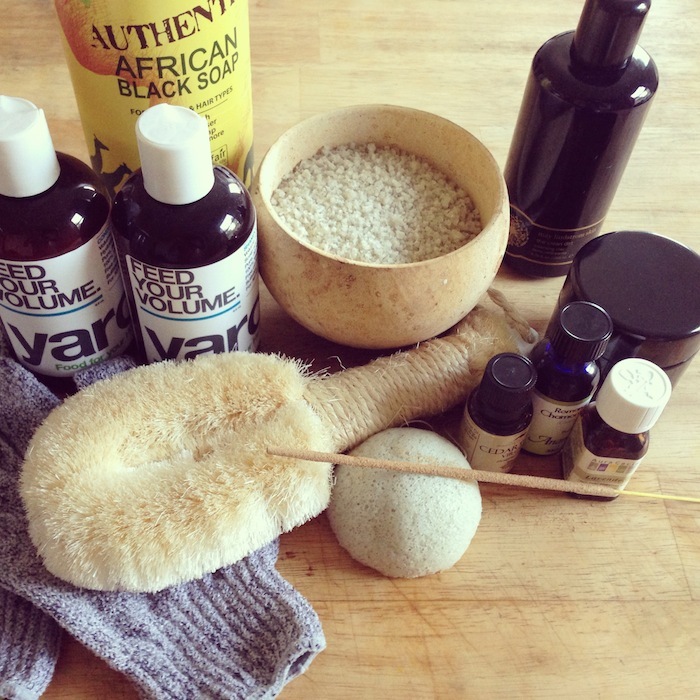 Below are the treasures in May’s bath that help her look and feel her best. As usual, I’ve starred the items I also use and love. Don’t forget to check out part 2 in May’s series! A tingly treat for the pits and feet — my husband loves this one too and uses it head to toe. I’m a salt fanatic and no good bath is complete without a big handful of pure sea salt thrown in. I feel the same way about a great meal. The answer to dull, congested and lifeless skin. This one’s a serious game changer. I leave it on for a few minutes to get maximum impact while I scrub up in the shower. It’s also beautiful blended with honey and a bit of coconut oil for a luxurious treatment. A secret new cleanser I’ve been perfecting in the studio. I can. not. wait. to release this. Hint: It looks like pudding, smells like heaven and happy buzzing bees are the makers of the magic main ingredient. A steady rotation of essential oils to drip into my bathwater or run through my hair. Right now, it’s Virginia Cedarwood, Roman Chamomile and Lavender. It’s a classic and always feels like home, no matter where life takes me. A new discovery; I love this funny little guy. Gentle enough to use every day, effective enough to skip a cleanser — something I insist is a must on a regular basis. Our skin needs space to learn to heal and regulate itself. I highly encourage cleanser-free days as a standard part of your beauty ritual. I forget to do this more often than not, remembering halfway through my shower when I’m already wet and it’s too late. But when I do remember — what a delicious treat! It takes getting used to, but the way your skin tingles after is crazy addicting. When I’ve forgotten to dry-brush, this is just as yummy. I like any excuse to take my time in the shower, and a massage from toes to forehead with scrubby hands makes my skin super soft and my mind clear and silent. I just recently switched over to Yarok from Alaffia (which I also love) and I am incredibly excited about how my wild and curly hair is responding — also adoring the sweet, woodsy scent of the conditioner. It smells like my studio!